Thanksgiving is a time to be thankful for our family, good health and fortune... And to also be thankful for CHOCOLATE TURKEY MOLDS. We have many different sizes of turkey chocolate candy molds, Turkey Lollipop molds, 2D turkey molds and 3D turkey molds and small bite size turkey chocolate candy molds! We offer pilgrim lollipop candy molds and of course the Cornucopia! And perhaps the best Thanksgiving plastic chocolate candy mold of all...Our large wishbone plastic chocolate candy mold. An excellent choice on Thanksgiving Day - Try your luck, each hold an end, and break together...seeing who has the larger piece and good luck all year! We pride ourselves in our excellent customer service and high quality products. 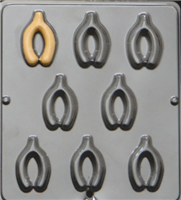 Please keep checking back for new molds as we add MANY Thanksgiving plastic chocolate candy mold to our line each year! Also don't forget to check out all of our other candy making supplies, including lollipop sticks, printed and clear candy bags, confectionery foil, sheer ribbon, curling ribbons, candy cups, baking cups, etc.! We have everything you need to make your party a success!